Felix Schniz graduated as a Bachelor of Arts in English and American studies from the University of Mannheim, where he subsequently joined the master’s programme Cultural Transformations of the Modern Age: Literature and Media. With a thesis exploring the metamodern tendencies of the third-person shooter Spec Ops: The Line (2012), he concluded the programme with excellence. Today, Felix Schniz is a PhD candidate and research assistant at AAU Klagenfurt. The focus of his dissertation are experiential dimensions of videogames. 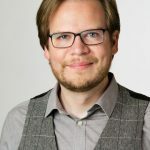 He furthermore is the director of studies for the master’s programme Game Studies and Engineering founded in 2016 and current head of the Klagenfurt Critical Game Lab. A growing number of independent games explore matters of loss, death, and remembrance. The genre of walking simulators, first and foremost, is prone to take players onto sojourns into lives gone, incidentally exploring strategies of memory and coping amidst virtual funerary monuments. With this conference paper, I explore the narrative and mechanic features used in the portrayal of grief in walking simulators. I highlight that the very gameplay conventions for which the genre is often patronised, combined with features of unreliable and fragmentary narration, create an ambience of encouraging mystery that eases the coming to terms with the departed. In conclusion, I juxtapose my research insights with contemporary traditions of grief in the western societies and argue for the consideration of new modes of obituary. Giant Sparrow. 2017. What Remains of Edith Finch. West Hollywood: Annapurna Games. Tale of Tales. The Graveyard. Bellevue: Valve Cooperation. The Chinese Room. 2012. Dear Esther. Brighton: The Chinese Room. The Chinese Room. 2016. Everybody’s Gone to the Rapture. Brighton: The Chinese Room.